I don’t think many people saw this one coming, but Google launched something completely radical on Wednesday. Google Instant (quite astonishingly, in my opinion), serves up pages of results as you type. 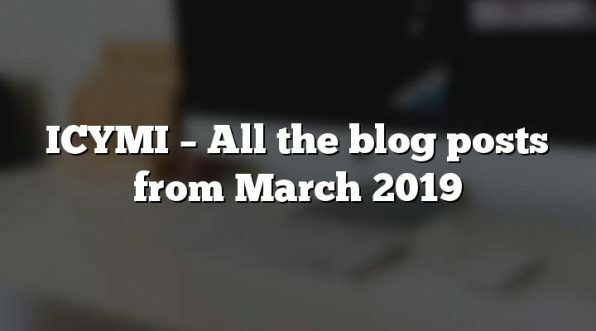 It’s going to have a serious impact on the way people search, and the whole field of search engine optimisation. What is it? Well, you can try it now* if you go to Google. *Please note that not everyone can see this feature yet. For now at least, if you’re in the UK, you need to be signed in to a Google Account, and need to use an up-to-date browser (nothing older than Internet Explorer 8). Right, start typing in a search …let’s say “widget”. Wow. As soon as you typed the “w”, up came the results for what I assume is the most commonly-searched phrase beginning with that letter, which is “weather”. Continue on: “wi”… Wikipedia; “wid” …Widnes (! ); “widg” …widgets. That’ll do. If your reading is much faster than your typing – and whose isn’t? – then you’ll probably have noticed you’re on the right results page already, after typing in just four letters. Let’s ignore the amazing amount of extra data Google is delivering with this new system, and focus on what it means for us as information providers. You’ll have noticed one straight away. I was going to type in a search for “widget”, but after four letters, I had a results page for “widgets” in front of me. That’ll do – I probably wouldn’t type in any more. Note the difference, however. I’m now looking at the results page for “widgets” rather than “widget”, and it’s not the same thing. So the actual searches which people make are going to change at the most fundamental level. But it gets much more intriguing. People are already speculating that searchers could change what they’re searching for on the fly, as they see these various sets of results. Here’s an example: I want to find out how a brushless motor works, so I start a search for “brushless motor”. Now, as I type in my search term, the moment I get to “brushl”, I see a relevant set of results, for “brushless motor”. That’s great. But my eye alights on the top result as I do this, and it’s “Brushless DC electric motor” on Wikipedia. Without pausing, I realise that of course, it’s the “DC” types I was interested in, so I continue my search query and attempt to type in “brushless dc motor”. So I’ve already changed my query, and anyone who’s on the first page of results for “brushless motor” but not “brushless dc motor” has lost out. 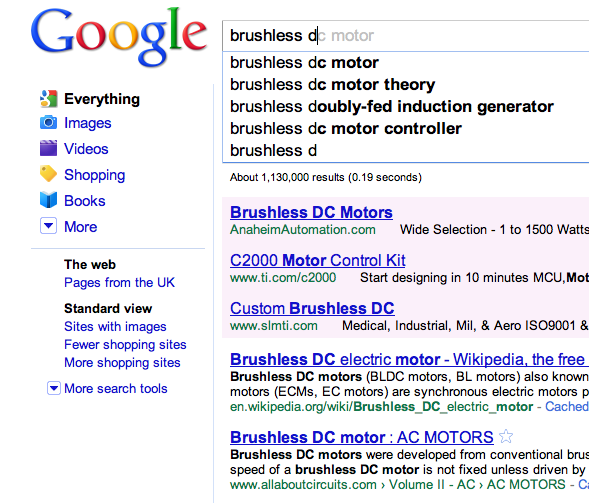 However, when I get to “brushless d”, Google offers me, with one mouse click, a search for “brushless dc motor theory”. That’s even better. I click that and get a set of results which push even the mighty Wikipedia down the page. A set of results which are what I want, but for a search which I didn’t intend to type in about 3 seconds ago. How this will affect all our previous efforts to position ourselves in the Google results, I really don’t know. 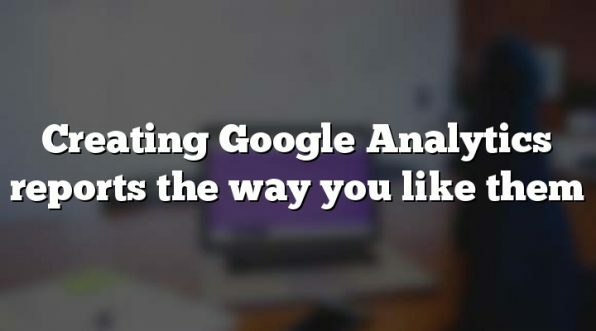 We’re all going to have to pore over our Google Analytics reports during the next few weeks and months to see what’s happening. But there’s going to be a lot more to say on this subject, so watch this space. Have you noticed that as well as organic results being presented as you type so are Adwords. This means that although I have set my adverts to only be displayed for the keywords I specify, Google is now displaying them for keywords it assumes will be typed in. Will such displays be counted as impressions therefore affecting CTR, especially if the final search phrase isn’t one I selected? It could also mean an increased bounce rate as people click on things unrelated to what they started out to research . What happens to long tail phrases used to trigger adverts, if people are served with a set of results before they finish typing then the LTP may never get typed. * The user begins to type a query on Google and clicks anywhere on the page (a search result, an ad, a spell correction, a related search). * The user chooses a particular query by clicking the Search button, pressing Enter or selecting one of the predicted queries. * The user stops typing, and the results are displayed for a minimum of 3 seconds.